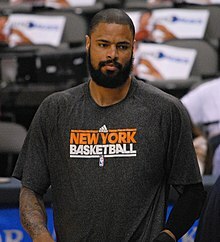 For the American football player, see Tyson Chandler (American football). Chandler was born to Frank Chandler and Vernie Threadgill, though he did not meet his father Frank until later in his life. He grew up in a family farm in Hanford, California, just south of Fresno, California. Chandler began playing basketball at the age of three years on a basket Chandler's grandfather, Cleotis, fixed on a tree. Chandler grew up doing farm work such as milking cows, slopping pigs, and cultivating crops. At the age of nine years, Chandler and his mother moved to San Bernardino, California; he was already nearly six feet tall. As a child, Chandler was teased because of his height; children on his school basketball team joked that he was older than he really was, and that he had been left back several times in school. Chandler and his family then moved to Compton, California, where he enrolled at Dominguez High School, a school known for its athletics, producing basketball players such as Dennis Johnson and Cedric Ceballos. In his freshman year, Chandler made the varsity team and played with future NBA player Tayshaun Prince, who was then a senior. With the Dominguez Dons, Chandler became a teenage sensation; current players such as DeMar DeRozan watched him play and claimed "he was like Shaq". Point guard Brandon Jennings, who was a ball boy for Dominguez at the time, said, "You'd see the girls around Tyson, the Escalade he drove, and you wanted to be like him". Chandler earned accolades from Parade Magazine and USA Today, and was selected to the McDonald's High School All-America Team. As a freshman, he was profiled on current affairs TV program 60 Minutes. In his junior year, Chandler averaged 20 points, 12 rebounds, 6 assists and 3 blocks. In his senior year, Chandler led Dominguez to a state championship and a 31–4 record, averaging 26 points, 15 rebounds, and 8 blocks a game. Chandler was recruited by several universities and considered UCLA, Arizona, Syracuse, Memphis, Kentucky and Michigan. Chandler then declared for the 2001 NBA draft as a prep-to-pro. Chandler was selected by the Los Angeles Clippers with the second overall pick in the 2001 NBA draft, before being immediately traded to the Chicago Bulls for former No. 1 overall pick Elton Brand. The Bulls placed their rebuilding efforts on the backs of two teenagers in Chandler and Eddy Curry. Chandler's 2003–04 season saw him appear in a career-low 35 games. He missed two months early in the season with a bad back, before missing the final weeks of the season after landing hard on his back on March 27 against the Atlanta Hawks. In September 2005, Chandler signed a six-year deal with the Bulls. In July 2006, the Bulls looked to deal away Chandler, who had five years and $54 million left on his contract, in order to pursue Ben Wallace. On July 14, 2006, Chandler was traded to the New Orleans Hornets in exchange for P. J. Brown and J. R. Smith. Chandler led the NBA in offensive rebounds in both 2006–07 and 2007–08, ranking second in the league in rebounds per game in 2006–07 and third in rebounds per game in 2007–08. He also ranked second in the NBA in field goal percentage in 2007–08 (.623) and would have led the league at .624 in 2006–07 but fell four field goals short of the statistical minimum to qualify. On February 17, 2009, Chandler was traded to the Oklahoma City Thunder in exchange for Chris Wilcox, Joe Smith and the draft rights to DeVon Hardin. After examining Chandler's left big toe however, the Thunder determined that the risk of re-injury was too great and did not give Chandler a clean bill of health. As a result, on February 18, the trade was rescinded and Chandler was sent back to the Hornets. Chandler appeared in just 45 games during the 2008–09 season, missing 29 of the team's final 44 games due to left ankle injuries. Chandler finished the 2008–09 season as the franchise's all-time leader in field goal percentage (.611) and rebounds per game (11.3), while ranking fifth in total rebounds despite playing just 197 career games with the team (2,225). On July 28, 2009, Chandler was traded to the Charlotte Bobcats in exchange for Emeka Okafor. In his lone season with the Bobcats, Chandler played in 51 games (starting 27) and averaged 6.5 points, 6.3 rebounds and 1.1 blocks despite being hampered by a stress reaction in his left foot that caused him to miss 29 games. On July 13, 2010, Chandler was traded, along with Alexis Ajinça, to the Dallas Mavericks in exchange for Erick Dampier, Eduardo Nájera, Matt Carroll and cash considerations. Chandler was the perfect fit during his first season with the Mavericks, anchoring their defense on a team with Dirk Nowitzki, Jason Terry and Jason Kidd. He was credited with giving the Mavericks the 'toughness' and defensive intensity that they sorely lacked, earning selection to the NBA All-Defensive Second Team for his efforts. He helped them reach the 2011 NBA Finals, where they faced the Miami Heat. In Game 4 against the Heat, with Nowitzki under the weather and ailing backup center Brendan Haywood unable to stay in the game, Chandler had 13 points and 16 rebounds in an 86–83 win that tied the series at 2–2. He grabbed nine offensive boards, with eight coming after the first quarter. The Mavericks went on to defeat the Heat in six games, with Chandler winning his first and so far only championship. Following the 2010–11 season, Chandler was tipped to be a highly sought-after free agent. He was heavily courted by the Golden State Warriors and Houston Rockets among other teams. While they were keen to retain him, the Mavericks were cautious not to overextend on Chandler and risk missing out on Dwight Howard or Deron Williams in 2012. As a result, they offered only a two-year deal to Chandler, which he declined. Mavericks owner Mark Cuban infamously broke-up the championship-winning team, choosing to add Lamar Odom, Vince Carter and Delonte West instead of bringing back Chandler, J. J. Barea and DeShawn Stevenson. At the time, Cuban chose to proceed cautiously in the era of a new collective bargaining agreement, believing that financial flexibility (and not locking in veterans to long-term deals that would eat up future cap space) was more valuable than trying to repeat as champions. In August 2016, Chandler noted that if the Mavericks had not broken up the 2011 championship-winning team, they would have gone on to win back-to-back titles in 2012. On December 10, 2011, Chandler was acquired by the New York Knicks via sign-and-trade as part of a three-team trade, joining the Knicks on a reported four-year, $58 million contract. With Chandler anchoring the middle, New York's defense improved markedly in 2011–12. After finishing 22nd in defensive efficiency in 2010–11, the Knicks finished fifth in defensive efficiency in 2011–12. Chandler finished the season with a league-leading 67.9 field-goal percentage, the third highest in league history at the time behind only Wilt Chamberlain with 72.7 in 1972–73 and 68.3 in 1966–67. In May 2012, he was named the NBA Defensive Player of the Year and earned NBA All-Defensive Second Team honors. He became the first player in franchise history to win defensive player of the year, and joined Alvin Robertson (1986) and Dikembe Mutombo (1995) as defensive players of the year on the second all-defensive team. Due to a different voting system for All-Defensive, Oklahoma City's Serge Ibaka was the forward on the first team, while Orlando's Dwight Howard was the center. Additionally, Chandler was named to the All-NBA Third Team. In January 2013, Chandler was named an NBA All-Star for the first time in his 12-year career, earning selection as an Eastern Conference reserve for the 2013 NBA All-Star Game. In early February, he tied a franchise record with three straight 20-rebound games, becoming the first Knicks player to have 20 in three straight games since Willis Reed in December 1969. On February 27, he had 16 points and a career-best 28 rebounds in a 109–105 win over the Golden State Warriors. In May 2013, he was named in the NBA All-Defensive First Team, becoming the first Knicks player to earn first-team honors since Charles Oakley in 1994. Marred by injury early in the 2013–14 season, it took Chandler some time to get his rhythm back. A right knee injury suffered on November 5 against the Charlotte Bobcats and an upper respiratory illness endured in early January resulted in Chandler appearing in just 55 games. On June 25, 2014, Chandler was traded back to the Dallas Mavericks along with Raymond Felton in exchange for Shane Larkin, Wayne Ellington, José Calderón, Samuel Dalembert, and two second round picks in the 2014 NBA draft. The move reunited Chandler with championship comrades Dirk Nowitzki and J. J. Barea, as well as coach Rick Carlisle. In 75 games during the 2014–15 season, Chandler averaged a double-double with 10.3 points on 66.6 percent shooting and 11.5 rebounds, in addition to 1.2 blocks. With his third season averaging a double-double while shooting at least 60 percent from the field, Chandler matched Wilt Chamberlain and joined Artis Gilmore as the only players in league history to accomplish this at least three times in their careers. With a career field goal percentage of 59.1 percent at the end of the 2014–15 season, Chandler had the second-highest field goal percentage in NBA history among those with at least 2,000 makes, trailing only Gilmore. On July 9, 2015, Chandler signed a four-year, $52 million contract with the Phoenix Suns. On November 27, he suffered a strained right hamstring against the Golden State Warriors. He subsequently missed eight games. On January 21, Chandler grabbed a season-high 20 rebounds in a 117–89 loss to the San Antonio Spurs. Two days later, in a 98–95 win over the Atlanta Hawks, Chandler tied a Suns record with 27 rebounds, including 17 in the first half, and also had 13 points and a season-high five assists. His 27 rebounds equaled the record total set by Paul Silas in 1971, and his 13 offensive boards set a franchise record. Chandler also became the first Suns player in franchise history to record consecutive 20-rebound games. On December 11, 2016, Chandler had 14 points and 21 rebounds in a 120–119 overtime loss to the New Orleans Pelicans. Two days later, he grabbed a season-best 23 rebounds in a 113–111 overtime win over the New York Knicks. With his third 20-rebound game of the season on January 3 in a 99–90 win over the Miami Heat, Chandler became the first Suns player with three-plus in a season since Charles Barkley (5) in 1993–94. On January 21, in a 107–105 win over the New York Knicks, Chandler set a team record by grabbing 15-plus rebounds in seven consecutive games. One night after setting the mark, Chandler ended his franchise record and career high of consecutive 15-plus rebound games at seven with nine rebounds against the Toronto Raptors. His best stretch of the season came between January 19–24, where he had three games of over 16 points (averaging 17.25) and over 16 rebounds (averaging 14.5), including scoring a season-high 22 points twice. Chandler appeared in 47 of the Suns' first 57 games before being deactivated following the All-Star break. Chandler reportedly told Suns management at the trade deadline he did not want to be dealt, and they acquiesced to his wishes. During the 2017–18 season, Chandler battled through a neck injury that sidelined him periodically for 36 total games. On January 14, 2018, Chandler grabbed 14 rebounds against the Indiana Pacers to become the 40th player in league history to reach 10,000 for his career. He played in just 46 games in 2017–18, including missing the final month of the season. After starting the 2018–19 season with a reduced role due to the arrival of rookie Deandre Ayton, Chandler and the Suns reached a buyout agreement on November 4, 2018. On November 6, 2018, Chandler signed with the Los Angeles Lakers. Chandler was named first alternate on the United States national team which competed in the 2008 Beijing Olympics. Chandler was a member of the United States team at the 2010 FIBA World Championship, a team that finished 9–0 in the tournament and won the gold medal, the USA's first world championship since 1994. He played in all nine World Championship games as a backup center, averaged 2.6 ppg and 2.7 rpg, shot 64.3 percent from the field, and blocked five shots. Chandler was chosen to play for the United States team in the 2012 London Summer Olympics, and was named the team's starting center. The United States team finished undefeated in the tournament and won the gold medal over Spain with a 107–100 victory. Chandler played 9 minutes, and made 1 of 2 shots from the field. He ended the game with two points, which were the first points scored during the game. Until the age of 10, Chandler grew up with his grandfather on a farm in central California. His sister, Erica, played basketball at Pepperdine University. He has three brothers: Terrell, Tervon, and Ryan. His paternal grandmother is of German descent. Chandler is the son of Frank Chandler and the late Vernie Re Threadgill. Chandler and his wife Kimberly were married in 2005. They have three children. Chandler and his wife organized a charity to help New Orleans families who suffered from Hurricane Katrina. The charity helped purchase "small things" (as Chandler said) for the families' homes: TVs, stoves, microwaves, refrigerators, pots, pans etc. The wives of Chandler's teammates helped in the efforts. He was the subject of a limited edition 100 copy zine titled "Tyson Chandler". The zine was created in fall 2011 by Camilla Venturini and the photographer Ari Marcopoulos, and was the subject of a lengthy article in the Wall Street Journal. In 2016, Chandler joined UNICEF Kid Power as a UNICEF Kid Power Champion for a mission in Uganda, in an effort to fight global malnutrition and as well as raise awareness among kids, via the world's first "wearable for good". ^ Henson, Steve (June 24, 2001). "California Lottery". Los Angeles Times. Retrieved November 8, 2012. ^ a b "Tyson Chandler Biography". JockBio. October 2, 1982. Retrieved April 24, 2012. ^ "Galleries". CNN. January 17, 2011. ^ Johnson, K.C. (June 18, 2016). "Bulls rolled dice on Tyson Chandler and Eddy Curry 15 years ago". ChicagoTribune.com. Retrieved November 8, 2018. ^ "Bulls drop eight straight on road". ESPN.com. January 31, 2004. Retrieved November 8, 2018. ^ "Hawks win 2 in a row for second time this season". ESPN.com. March 27, 2004. Retrieved November 8, 2018. ^ "Briefs: Chandler agrees to contract terms with Bulls". SeattleTimes.com. September 2, 2005. Retrieved November 8, 2018. ^ Stein, Marc (July 6, 2006). "Bulls to deal Chandler to Hornets for Brown, Smith". ESPN.com. Retrieved November 8, 2018. ^ "Bulls trade Tyson Chandler to Hornets for PJ Brown and JR Smith". InsideHoops.com. July 14, 2006. Retrieved November 8, 2018. ^ a b c d "Bobcats Acquire Tyson Chandler from New Orleans Hornets". NBA.com. July 28, 2009. Archived from the original on July 31, 2009. ^ "Thunder Aquire Center Tyson Chandler". NBA.com. February 17, 2009. Archived from the original on July 6, 2009. ^ "Thunder Rescind Trade for Tyson Chandler". NBA.com. February 18, 2009. Archived from the original on December 2, 2009. ^ Broussard, Chris; Stein, Marc (February 20, 2009). "Thunder reject Chandler; trade off". ESPN.com. Retrieved November 8, 2018. ^ "Artest, Rockets overcome Yao's absence, end Hornets' five-game home streak". ESPN.com. March 19, 2009. Retrieved November 8, 2018. ^ "Finley, Duncan key as Spurs clinch Southwest Division, No. 3 seed". ESPN.com. April 15, 2009. Retrieved November 8, 2018. ^ a b "MAVERICKS ACQUIRE CHANDLER AND AJINCA IN FIVE-PLAYER TRADE". NBA.com. July 13, 2010. Archived from the original on July 15, 2010. ^ Neuharth-Keusch, AJ (February 16, 2016). "The most lopsided trades in NBA history". usatoday.com. Retrieved December 26, 2017. ^ "There's a New Sheriff In Town -- Knicks' Tyson Chandler Wins Defensive Player of the Year". paperblog.com. Retrieved September 6, 2012. ^ Caplan, Jeff (June 9, 2011). "Tyson Chandler rises to the occasion". ESPN.com. Retrieved November 8, 2018. ^ a b c "What's next for the Dallas Mavericks?". ESPN.com. June 14, 2011. Retrieved November 8, 2018. ^ a b c MacMahon, Tim (December 11, 2011). "Tyson Chandler agrees with Knicks". ESPN.com. Retrieved November 8, 2018. ^ Dyce, Mike (June 30, 2014). "Mark Cuban still thinks breaking up 2011 Championship team was right decision". thesmokingcuban.com. Retrieved November 8, 2018. ^ Daniels, David (December 31, 2011). "Mark Cuban Would Be Foolish to Blow Up Mavericks for Chance at Howard, Williams". bleacherreport.com. Retrieved November 8, 2018. ^ Pollakoff, Brett (September 23, 2014). "Mark Cuban on bringing back Tyson Chandler: 'Let's just say I learn from my mistakes'". nbcsports.com. Retrieved November 8, 2018. ^ Webster, Danny (August 19, 2016). "Tyson Chandler tells Jason Terry the Mavericks would've won back-to-back NBA titles". mavsmoneyball.com. Retrieved November 8, 2018. ^ "Three-team trade brings center Tyson Chandler to Knicks". InsideHoops.com. December 10, 2011. Retrieved November 8, 2018. ^ a b "Knicks' Chandler wins Kia Defensive Player of Year". NBA.com. May 2, 2012. Archived from the original on May 7, 2012. ^ Begley, Ian (May 2, 2012). "Tyson Chandler wins award". ESPN.com. Retrieved November 8, 2018. ^ Young, Royce (May 2, 2012). "Tyson Chandler wins Defensive Player of the Year in close vote with Serge Ibaka". cbssports.com. Retrieved November 8, 2018. ^ Beck, Howard (April 26, 2012). "After Restful Final Game, Knicks Head to Miami". NYTimes.com. Retrieved November 8, 2018. ^ a b c Begley, Ian (May 24, 2012). "Tyson named to all-defensive second team". ESPN.com. Retrieved November 8, 2018. ^ "LeBron, Durant highlight 2011–12 All-NBA First Team". NBA. May 24, 2012. Archived from the original on August 18, 2012. Retrieved May 24, 2012. ^ Shetler, Matt (January 24, 2013). "2013 NBA All-Star Game: Tyson Chandler makes first All-Star team". dailyknicks.com. Retrieved November 8, 2018. ^ "Tyson Chandler has 20 rebounds for third straight game as Knicks win". ESPN.com. February 4, 2013. Retrieved November 8, 2018. ^ "Stephen Curry's 54 points not enough as Warriors fall to Knicks". ESPN.com. February 27, 2013. Retrieved November 8, 2018. ^ Zwerling, Jared (May 14, 2013). "Chandler named to All-Defensive First Team". ESPN.com. Retrieved November 8, 2018. ^ a b Diglio, Frank (April 23, 2014). "Tyson Chandler: 2013-14 Season Review". dailyknicks.com. Retrieved November 8, 2018. ^ "Bobcats hold off Knicks late; Tyson Chandler hurt". ESPN.com. November 5, 2013. Retrieved November 8, 2018. ^ "Carmelo Anthony sparks Knicks' win over Mavericks". ESPN.com. January 5, 2014. Retrieved November 8, 2018. ^ "Tyson Chandler 2013-14 Game Log". Basketball-Reference.com. Retrieved November 8, 2018. ^ "Mavs acquire Tyson Chandler, Raymond Felton from Knicks". Mavs.com. June 25, 2014. Retrieved June 25, 2014. ^ Sneed, Earl K. (May 5, 2015). "Tyson Chandler faced challenges in leading Mavs through '14-15 season". Mavs.com. Archived from the original on October 31, 2016. ^ a b "Suns Sign Tyson Chandler". NBA.com. July 9, 2015. Retrieved July 9, 2015. ^ Stein, Marc (July 1, 2015). "Tyson Chandler agrees to four-year, $52 million deal with Suns". ESPN.com. Retrieved November 8, 2018. ^ "Stephen Curry scores 41, Warriors pour in 3s to stretch record start to 17-0". ESPN.com. November 27, 2015. Retrieved November 8, 2018. ^ "Knight's 25 points lead Suns over Timberwolves 108-101". NBA.com. December 13, 2015. Retrieved December 13, 2015. ^ "Tyson Chandler 2015-16 Game Log". Basketball-Reference.com. Retrieved November 8, 2018. ^ "Spurs cruise to 12th straight win, 117-89 win over Suns". NBA.com. January 21, 2016. Retrieved January 22, 2016. ^ "Goodwin hits 3 with 0.1 seconds left, Suns beat Hawks 98-95". NBA.com. January 23, 2016. Retrieved January 23, 2016. ^ "Frazier gets triple-double, Pelicans beat Suns 120-119 in OT". ESPN.com. December 11, 2016. Retrieved December 11, 2016. ^ "Bledsoe, Suns beat Knicks 113-111 in OT". ESPN.com. December 13, 2016. Retrieved November 8, 2018. ^ "Heat vs. Suns – Box Score". ESPN.com. January 3, 2017. Retrieved January 3, 2017. ^ Haller, Doug (January 25, 2017). "Phoenix Suns' Tyson Chandler takes the fight to Father Time". azcentral.com. Retrieved November 8, 2018. ^ "Bledsoe's career day leads Suns over Raptors 115-103". ESPN.com. January 22, 2017. Retrieved January 22, 2017. ^ Daniels, Matthew (May 9, 2017). "2016-17 Player Reviews: Tyson Chandler". valleyofthesuns.com. Retrieved November 8, 2018. ^ a b "Tyson Chandler 2016-17 Game Log". Basketball-Reference.com. Retrieved November 8, 2018. ^ Moore, Matt (March 17, 2017). "Tyson Chandler rejected pre-deadline trade to NBA contender to stick with lowly Suns". cbssports.com. Retrieved November 8, 2018. ^ Sidery, Evan (August 11, 2018). "BSOTS 2018-19 Player Previews: Tyson Chandler". brightsideofthesun.com. Retrieved November 8, 2018. ^ "Collison, Oladipo lead balanced Pacers to rout of Phoenix". ESPN.com. January 14, 2018. Retrieved January 14, 2018. ^ "Tyson Chandler 2017-18 Game Log". Basketball-Reference.com. Retrieved November 8, 2018. ^ Helin, Kurt (November 3, 2018). "Reports: Suns to buy out Tyson Chandler; Lakers will be landing spot". Yahoo.com. Retrieved November 4, 2018. ^ "Suns and Tyson Chandler Reach Buyout Agreement". NBA.com. November 4, 2018. Retrieved November 4, 2018. ^ "Lakers Sign Tyson Chandler". NBA.com. November 6, 2018. Retrieved November 6, 2018. ^ "USA Basketball Profile: Tyson Chandler". usabasketball.com. ^ "Gold Medal Game Statistics". usabasketball.com. August 12, 2012. Archived from the original on August 14, 2012. Retrieved August 12, 2012. ^ "NBA Finals 2011 Game 5 Half-time Report". ABC Sports. June 9, 2011. ^ Coro, Paul (September 16, 2015). "Phoenix Suns' Tyson Chandler to reacclimate Markieff Morris". AZ Central.com. Retrieved September 16, 2015. ^ Erica Chandler. Pepperdine University. Retrieved on November 8, 2012. ^ Roman Modrowski. "The man of the house: He's still only 19, but Tyson Chandler has grown up fast". Chicago Sun-Times. June 23, 2002. ^ Fisher, Mike (November 30, 2010). "One-on-One with Mavs center Tyson Chandler". Fox Sports Wisconsin. Retrieved June 15, 2011. ^ Evans, Candy (June 10, 2011). "Houses of Dallas Mavericks emulate NBA Finals' success". Pegasus News. Archived from the original on June 12, 2011. Retrieved June 15, 2011. Tyson Chandler and his wife Kimberly are super great people — they recently organized a charity to help New Orleans families who suffered from Hurricane Katrina. ^ Cohen, Ben (November 19, 2011). "One Baller's Biggest Fan". Wall Street Journal. Retrieved November 20, 2011. ^ "Tyson Chandler: UNICEF Kid Power Champion". UNICEF Kid Power.